RetailWomensSuits holds the most significant and most luxurious collection of women’s church dresses, suits, and men’s church dresses, work suits, and walking dresses. Our goal is to channel the latest accessories and dress designs on a single platform, offering incredibly low prices which make style within reach of every woman and man. Looking for affordable designer label dresses? RetailWomensSuits brings you the most extensive designer collection for women’s church dresses, men’s suits and other related dresses. Our designer label collection comprises original and elegant church dresses contributed by top-class designers such as Ben Marc Women's Church Suit, Milano ensembles Misty Lane Evening Wear special occasion formal dresses. Moreover, GMI woman's church suits, Donna Vinci embellished suits, Fifth Sunday church suits, Roma woman’s church suits, Terramina Women's Church Suits, Aussie Austine Mother of the Bride or bridesmaid dresses, Champagne Ladies Suits, DVC Knits suits, Dorinda Clark Coles' suits, and Tally Taylor Church Special Occasion Set. At RetailWomensSuits, we cater the dressing and style needs of customers who are looking to stand out from the crowd during any church event. Our vast catalog encompasses women’s wear, men’s wear, and church accessories. RetailWomensSuits is also proficient in the deliverance of choir uniforms or bridesmaid dresses for young girls, boys and women, and men of all ages and sizes. RetailWomensSuits makes no compromise on quality and design which is why all of our dresses and footwear are designed from high-quality material and styled with the addition of embroidery and rhinestone embellishments. 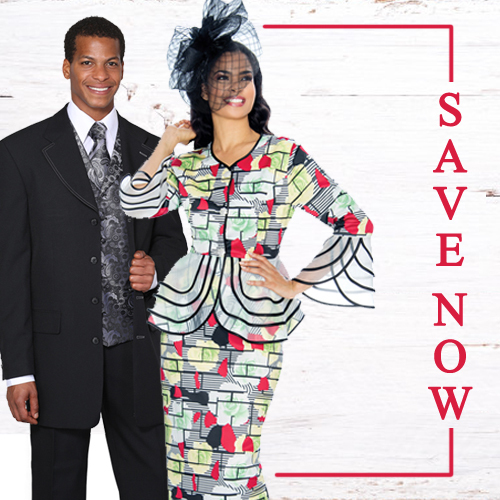 Our church hat, men’s shoe, and tie collection are the most stylish and most affordable of all. At RetailWomensSuits, find the latest designer wear and accessories catering the church style needs of men and women at affordable prices. We deliver what you seek. For more information on the availability of dresses, contact us today or browse through our online catalog at RetailWomensSuits.